Chop – the single word is enough to make your mouth water. The balance of outside crust and soft stuffing has been made it one of the popular starters. It is a popular and common street food. It is generally served with Onion and Cucumber rings and a delightful Sauce (mainly Tomato). Egg Chops: Egg is such an ingredient that can be used in different dishes from Starters and Main Courses to Desserts. Amongst, various Starters, egg chop are a prominent one that can be easily served in various parties and occasions. Its delicacy enhances during the rainy season. 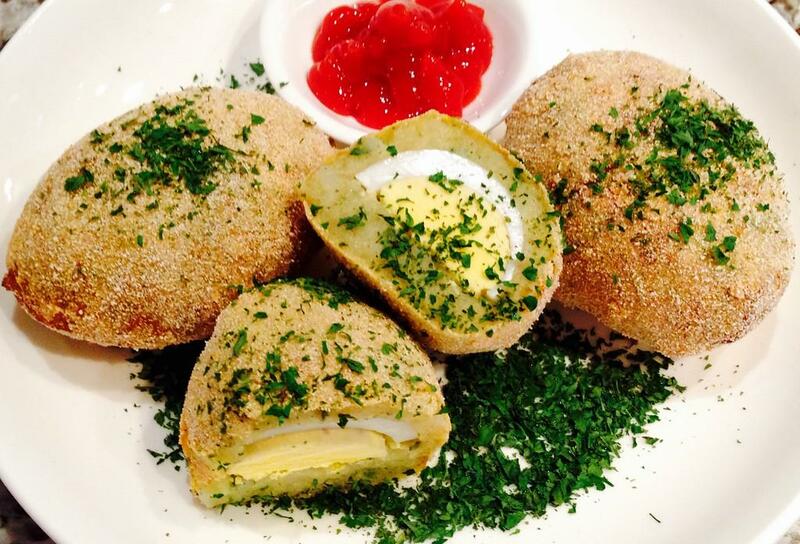 In the romantic and wet weather, you can hardly avoid these wonderful deep-fried Egg Chops. You can prepare these Chops by following its easy recipe. Vegetable Chops: It is another famous variation of Chops. Mainly Potato is stuffed inside these Chops. For vegeratian people, it can be a mouth-watering treat. Paneer Chops: It is another version of Vegetable Chops. Mashed Paneer is stuffed along with other ingredients. It can be considered as an amazing Starter of Paneer. Chicken Chops: Non-Vegetarian and especially the Chicken lovers are usually craving for this dish. Fried Chicken pieces are inserted into the Chops that make them simply heavenly delightful. Mutton Chops: It is obvious that Mutton lovers prefer the Mutton Chops. The process of preparation is almost same as Chicken Chopsjust the meat is different. Fish Chop: It is one version of Fish Cutlet. It goes irresistible with kashundi or mustard It is accompanied with Onion rings and Lemon squeeze. Beetroot Chops: You can relish Beetroot in this style. Beetroot acts as a substitute of Mutton. Therefore, Vegetarian people can easily have this Chop. It is an amazing snack that can be served in the parties. It is a simple and quick recipe. Banana Flower Chops: It is a healthy and flavourful Bengali delicacy that is called as Mochar Chop. Serve this amazingly delicious Chop kasundi or your favorite chutney. Cabbage Cutlet: Many kids do not want to eat Green Vegetables. In this delightful way, the Vegetable can be consumed. This Cabbage Cutlet can be either microwaved or fried. Sabudana Cutlet: In times of fasting, this Cutlet is usually prepared. It can be prepared to serve as the evening snack as well. It is an easy-to-prepare and simple recipe. Prawn Cutlet: Medium-sized Prawns are used to make this finger-licking Cutlet. For all the fish lovers, it will be a delightful treat. However, Prawn allergic people have to be very careful before consuming these Cutlets. Noodles Cutlet: In the party or any other occasion, this unique appetizer can win everyone’s heart through its mind-blowing taste. It is crisp and soft from outside and inside respectively. Boiled Noodles along with various Spices are used in this recipe. There are various other Chop and Cutlet recipes are available, with which you can surprise your family. Try them after learning the recipes.